October is National Book Month. However, PBS is encouraging people to read books throughout the year with an engaging series: The Great American Read . The May 2018 televised premier—hosted by TV personality and journalist Meredith Viera—was a two-hour celebration of "the power, passion and joy of reading through the lens of America's 100 best-loved books as chosen by the public." The 100 chosen works of fiction are available on the web; the list runs the gamut from popular novels to classics and from inspirational topics to science fiction. People vote for their favorite(s), take a quiz about which books they have read, and receive a score. The Association of American Publishers reports that revenues for first-quarter 2017 were $2.33 billion—a 4.9% increase over revenues in the same period in 2016. Net revenues by format are uneven. For example, revenue from e-books has decreased 5.3%, but revenue from downloaded audio books has increased 28.8%; revenue from hardback books has increased 8.2%, but revenue from paperback and mass-market books has decreased by 4.7%. 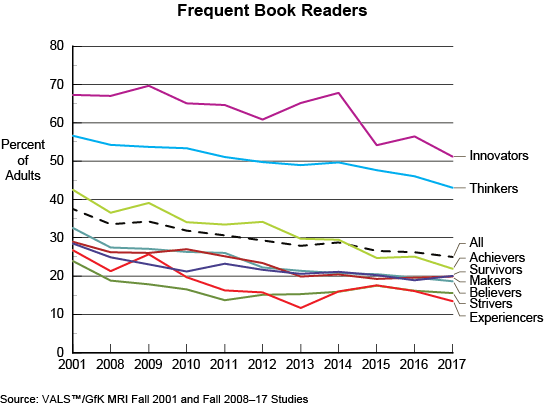 To learn which consumer groups are frequent readers (have read books once a month or more frequently), VALS™/GfK MRI data reveal that the proportion of frequent adult readers has declined from 38% in fall 2001 to 25% in fall 2017. Only two VALS groups are more likely than all adults currently are frequent readers: Innovators and Thinkers. Even though frequent reading for these two groups is trending down, the impact of audiobook-download purchases requires consideration. A data fact-check report is that of the 2% of US adults who purchased an audiobook in the past six months (fall 2017), 26% are Innovators, 24% are Thinkers, and 16% are Achievers—three groups more likely than all adults to do so. It makes perfect sense that information-intensive Thinkers are frequent readers. However, highly curious and information-ready Innovators are the most likely of all consumer groups to be frequent readers; that group is more likely than Thinkers to read both fiction and nonfiction books. For Innovators, a good read might provide an escape, inspiration, learning, or exposure to new ideas, different cultures, and time travel. Worried and Stressed about Money?